KawaiiPunk - Kawaii Mascot Blog: World Cup Wonders! What d’ya think? It’s a kawaii interpretation of the infamous “Hand of God” moment from the 1986 quarter-final between England and Argentina. I’ve cast yourself in the role of Diego Maradona - a fitting choice with a name like yours! 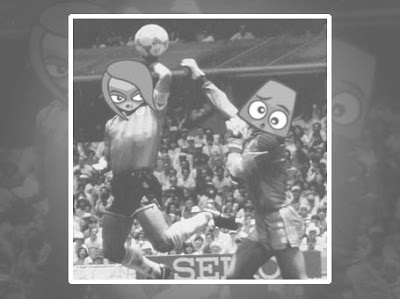 - and decided the Miffed Mascot should take the role of Peter Shilton - again, a fitting choice given the decision to let the goal stand! Roll on June 11th! Charlie “Chopper” McAllister. Aged 53. Thanks Charlie! What a great piece of art! And what a pleasure to see myself in such an infamous incident of sneakiness! Although the Ed Mascot has asked me to let our younger readers know that cheats never prosper - YAWN! Sugar Cakes. Sweets with Smiles! Knitting Dreams. Cutest Teddy Bears Ever!